Jon loves marinating and grilling pork chops when the weather turns nice. Last night he used a marinade that we had used on London broil a few weeks ago. It consisted of EVOO, Worcestershire, lime juice, fresh garlic, thyme, dry mustard, and turmeric. It is a really good marinade and was excellent on the beef. It was ok on the pork as well, but I think it definitely works better on beef. I wanted to make some "new to us" sides to go along with the chops. 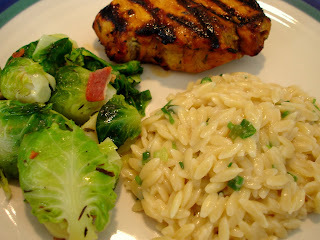 I consulted my favorite recipe website, Epicurious.com, and found a few good recipes. I decided on this recipe for Brussels sprouts with bacon and thyme for our veggie, and this one for orzo pilaf with green onions and Parmesan for a side. I pretty much followed the recipes exactly except for the fresh thyme - I substituted dry. I loved both recipes. 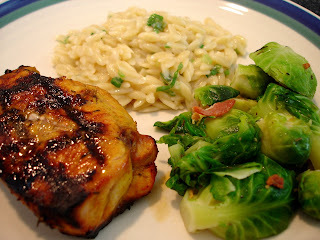 Jon loved the orzo, but wasn't a fan of the Brussels sprouts but only because thyme isn't his favorite flavor. I love making orzo in broth because it's a lot like a cheater-risotto. 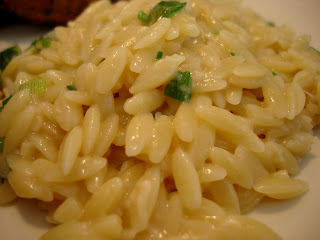 Risotto is one of my favorite things to cook, but sometimes you just want something quick and easy! Definitely take a look at those links - I'd highly recommend both recipes. I love orzo and risotto... A few months ago I discovered that using a pressure cooker you can have risotto cooked (not stirring required!) in just 6 minutes. Now, we can have it more often since it's so easy.